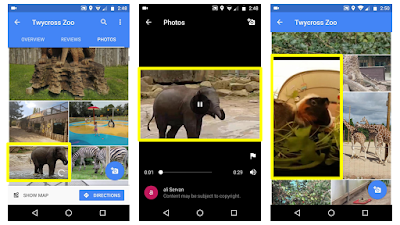 On learning of the ability to add a video to google on 23 Aug 17, I’ve explored the feature in great detail. I’ve added 71 videos to google maps and made 45 post in my Local Guides Resources Community. I’ve also created a youtube playlist called, How to Add Video to Google Maps which contains 28 videos which are embedded below (where video 28 is the oldest video - these numbers are a guide as of time or writing, will serve for this post). You will find two versions of the post edited The Tarp (one using PowerDirector, the other Google Photos Create a Movie). Videos 23, 25 and 26 are a slight side step in they actually place realtime video within the Maps App as an overlay, which includes a realtime gps pushpin. Video 21 is the first time I realised how restrictive 30 seconds is to do anything useful, which contrasts with the Hotel Chocolat Mousse (v20). Video 13-19 are about product demos with video. 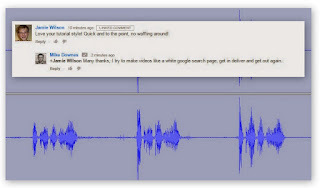 Where video 11 is an idea on how to share places with videos - create a simple list. Video 4 is an idea how Maps is looking like a nice little social network while videos 1 and 2 go in search of finding videos within places on Desktop - a very hit and miss affair, yet lots of fun trying. It’s also quite gratifying to find a place like the Golden Gate Bridge and see a misty landscape video attached to the page - such a different experience than search the web or youtube for the same video. On videos and production - I was delighted and pretty excited to see Videos finally being added to Maps. And I want to make that crystal clear in light of what I am about to say. Google in their post on 25 Aug, have started off far too simplistically in my opinion (which their ‘tap and hold’ for 10 seconds or ‘add 30 seconds’ from your camera roll’ (ref local guides blog post). Where in the second paragraph they offer a linked post called, How to post great videos on Google Maps. On reading this post, you get the same advice of 10secs, 30 secs and then advice to ‘shoot vertically - the tall way’. In my view this is terrible advice - sure mobile phones are held portrait and youtube are now catering for all video formats, but landscape is SO IMPORTANT in video making. It really is. This ‘How to post’ includes fives videos all recorded in portrait than do very little to show good practice. And keen eyes will spot the final ‘personal review’ video is timed at 58 seconds - and therefore will NOt to allowed to be posted at Maps without cutting off the last 28 seconds. I’m fully aware how Video at Maps is all a beta, but video making is NOT a beta at all - and that is why I have posted over 70 videos to Maps myself using a variety of technique and style. What has truly amazed me, how Google Local Guides have NOT TALKED ABOUT their own superb product photos.google.com and the brilliant Photo Assistant Create a Movie tool. All you have to do is select up to 50 videos from google photos and the app does the rest even including music - it’s SO FAST and SO EASY. For example, I was at a local 5k run last weekend, I recorded 43 video clips and Google Photos did the rest. The full length video is called, Decathlon 5k where on maps it’s split into five parts at the place page. For another example using Google Photos Create a Movie, take a look at this local food store tour that’s been open just three weeks, Welcome to New Street Co-op. I wanted to keep this video edit to exactly what Google Photos gave me, not changing anything at all. For video editing on Android I use PowerDirector by Cyberlink, it’s easy, fast and just marvellous. New to it or not so sure how to use it - check out my youtube playlist which has 42 videos, it’s called PowerDirector Android App Tutorials. I also video edit on win10 using Vegas Movie Studio Platinum 13.0 - two playlists 11.0 and 13.0. Summary - I learned about adding video to google maps four weeks ago (on 23 Aug 17), I tried it out and added 71 videos myself. I think the feature brings Maps to LIFE in a living breathing 3 dimensional way. I sincerely hope video on maps will flourish while the googlers who codeo it, will add new features as soon as possible including linking/sharing to each video and allowing comments. I also hope the 30 seconds is lifted to allow for 60 seconds. As I have found out by experience, spending three hours at a park following a fun run, will allow me to record 46 video files - 30 seconds is just too short..